Report: Africa’s Demographic Transition, Dividend or Disaster? A recent report published jointly by the World Bank and by Agence Française de Développement highlights the challenge of realizing Africa’s promised demographic dividend. 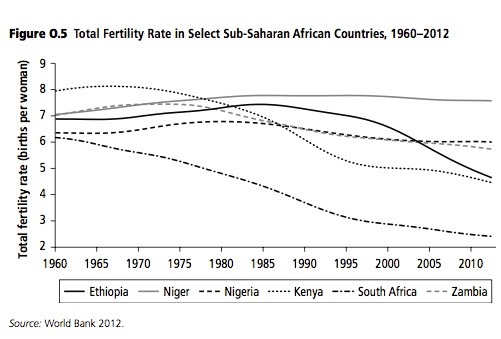 The title Africa’s Demographic Transition: Dividend or Disaster? (see footnote 1) sums up the authors’ thesis that the dividend is not an automatic result of falling fertility ratios (TFR). Instead, falling TFRs open a window of opportunity which can lead to a demographic dividend when governments and the public sector implement the requisite steps to capitalize on this opportunity. Lower child mortality usually leads to falling fertility ratios and improvements in women’s health. But most important among concurrent or subsequent initiatives are investments in education, and the provision of sufficient jobs to a booming working-age population. Declines in child mortality, followed by declines in fertility, produce a “bulge” generation and a period when a country has a large number of working-age people and a smaller number of dependents. Having a large number of workers per capita gives a boost to the economy provided there are labor opportunities for the workers. The first and perhaps most challenging step is to speed up the fertility decline in countries where it is currently slow or stalled. Reducing fertility leads to immediate gains in income per capita as youth dependency rates fall. However, achieving the full potential of the demographic dividend requires economic policies that take advantage of the opportunity. Formulating and implementing policies that strengthen financial institutions and encourage saving will channel rising incomes into domestic savings and investments that further fuel growth and development. Health, especially child health. Child health is a critical input into fertility declines. As children’s health and survival rates improve, family demand for more children declines as confidence in child survival increases. Smaller family sizes improve maternal health, which further improves child health, completing a virtuous cycle. Education, especially education for girls. Female education is a critical driver of lower desired fertility and the transition from high to low fertility. Fertility decline, in turn, has a strong effect on education by allowing for fewer, healthier, better nourished, and better educated children. Women’s empowerment, which is clearly related to the first two. Better educated and healthier women with more market, social, and decision-making power in the family—are likely to have fewer children (World Bank 2011). And women who have fewer children—as a result of delayed age of marriage, delayed first sexual contact, or more space between births—are much more likely to enter the paid labor market, to have higher earnings, and to be more empowered. 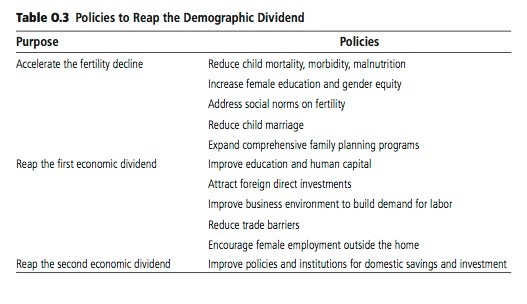 Further, the report provides a road map of the policies that are necessary to convert fertility decline into a first demographic dividend and a second demographic dividend. These policies are shown in Table 0.3 (all charts below are from the report). 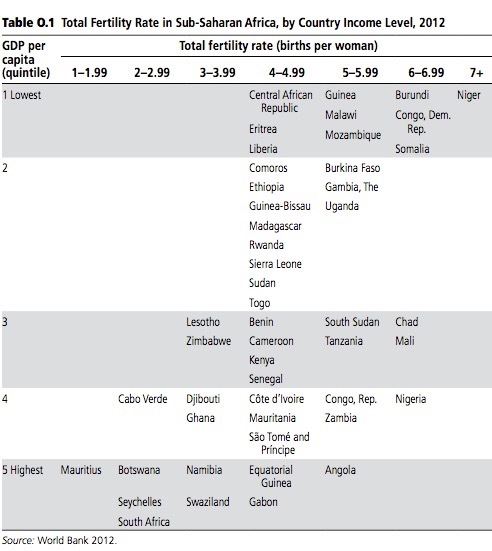 Table 0.1 shows a correlation between each country’s total fertility ratio (TFR) and its GDP per capita. Countries with high TFRs have lower GDP per capita. Some of the most populous countries, Kenya, Ethiopia and Tanzania are in the middle ranges, while others like DR Congo are near the GDP bottom (and TFR top). Nigeria is an outlier with better than average GDP per capita but a higher than average TFR. Botswana and South Africa have higher GDP per capita and lower TFRs. 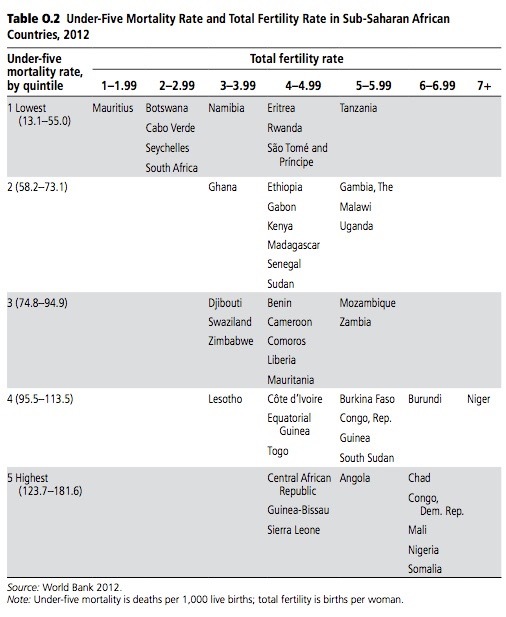 Table 0.2 shows the relation of child mortality and TFRs. Low mortality coincides with a low TFR. Nigeria and DR Congo are problematic with high mortality and high TFRs, whereas Tanzania still maintains a higher than average TFR despite relatively low child mortality. Figure 0.5 shows the evolution of TFRs for several countries since 1960. Niger’s remained high while South Africa’s declined. Nearly all country TFRs are falling, albeit at a slower rate than previously expected in some cases. 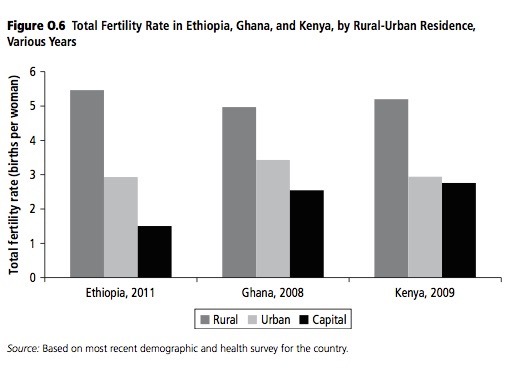 Figure 0.6 shows the clear divide in TFRs between rural and urban areas of Ethiopia, Ghana and Kenya. An increase in agricultural productivity and the creation of urban jobs will contribute to further declines in TFRs.